These little heirloom pieces are very unique and rich in history. It is a basket reproduced just as the Shaker sisters made it many years ago to be sold to the ladies that visited their stores. 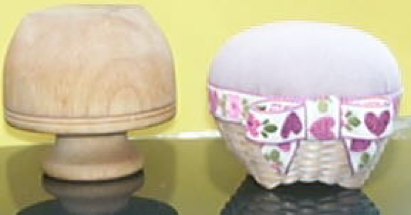 Your basket will be woven on a mold as the Shakers did and the pin cushion is assembled with saw dust as the originals were. No previous weaving experience is required. The Workshop fee is $75, which includes all materials, instructions and use of the instructor’s tools needed to complete your project. Bring a brown bag lunch.